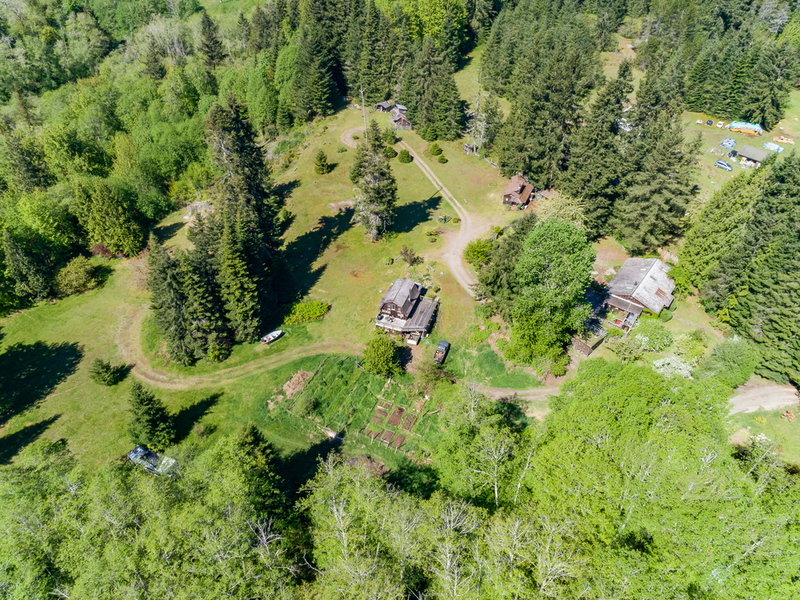 Approximately 15.5 acres of VERY UNIQUE property on the Little Qualicum River Vancouver Island B.C. Canada. Zoned agricultural but only partially in the Agricultural Land Reserve. The actual legal size of the property changes with the banks of the river though the perimeter stays constant. Property has 5 inhabitable buildings (view video, link at bottom of page) including a “tiny home”, two cabins under 8oo sq. feet, a main residence and a converted barn. Includes a free standing wood fired sauna. Sweeping views of Mount Arrowsmith and an ancient Eagle Tree situated in the middle of the upper field. The Little Qualicum River runs through the acreage leaving just under 5 acres on the other side from the fields and buildings. There are over 45 Rhododendrons and multiple other ornamental and flowering plants. Included also is a rustic and serene turtle pond complete with Lilly pads and migrating mallards. A 20-minute walk will take you to the ocean and the mouth of the Little Qualicum River. The estuary is a bird sanctuary established by the B.C. government in the 70's. At present the residences are being rented on a month to month basis and providing a gross income of $5,000 a month. There is a history of cash crop gardening (blueberries/raspberries, garlic, swiss chard, kale, and multiple varieties of squash), animal husbandry (goats, chickens, ducks for eggs, pigs, and horse boarding) and there is an orchard with 4 apple trees and 2 pear trees on the property. This unique property and its endless possibilities are a dream and a godsend for the right kind of person/persons. The potential for income by cash crops and vacation by owner or monthly rentals is vast. It has undeveloped potential to be a completely self-sustaining and occupation/employment producing investment. 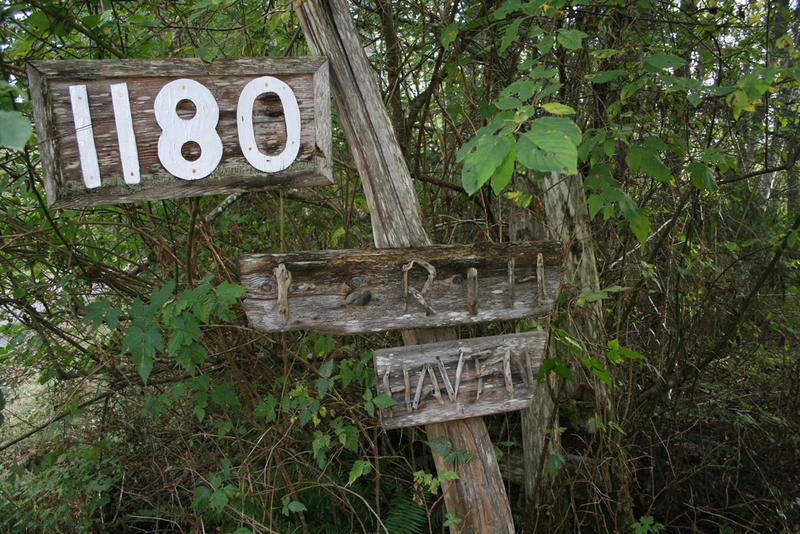 The property had been a commune in the early 1970’s. This collective living experiment dissolved shortly after its inception The buildings from that era have been maintained and upgraded since then and the original footprints are accepted as either legal conforming or legal non-conforming due to the fact they existed before the boundaries of the Regional District included the property. Due to the “legal non conforming” status of some of the dwellings only a small part of the purchase would be eligible for conventional financing methods. There are certainly some challenges for this property and yet the magical quality of such a unique place surpasses the demands of any challenges. There is a mortgage presently on the property. The tax assessment for the present year is not relevant to market value of this property so as such these figures do not affect the asking price directly due to the unique qualities/features of the property, and the legal non-conforming structures included. Our family purchased this property in 1970 and it has served as home to 3 generations at different points since that purchase. Initially the property was the site of a commune with as many as 28 people calling it home. The experiment in communal living lasted close to 2 years after which ideological differences caused the disintegration of the communal living aspect of the property. During the period when “Chicken Crest” was a growing concern among the network of communes springing up in the late 60’s and early 70’s on Vancouver Island we were situated in such an ideal location that often travellers from north, west and south would stop in for a sleep over on the way to parts other than. We were often hosts to folks from Lasquiti, Denman and Hornby Islands. People making their way to or from the West coast of the island would use our place as a stop over as well. The inhabitants of the farm also established themselves as gardeners, craftsmen and carpenters. A company was established to employ and generate income for the commune population. One of the contracts “Cosmic Construction” entered into was the removal and demolition of a number of commercial chicken coups on Eagle Crest Farm. Many of buildings were moved on a flatbed truck and relocated onto the property to become dwellings for a number of the young idealist residents, hence the “Chicken Crest” moniker. They were added onto and finished in a few different forms. As well there were other construction projects on and off the property. The existing barn became the centre for community meets and dinners as well almost nightly jamb sessions when the weather didn’t permit bon fires and outside parties. The main house is now a roughly 1800 sq. ft. 3-bedroom 2-bathroom, morning sunroom, kitchen-dinning area and living room structure with a common hall/library. The original structure was a small 2 bedroom, L.R. and Kitchen house built in the 40’s with a bathroom added in the early 50’s. The home is only 1/4 on concrete foundation, the rest of the building is on beam and block. There is an insulated skirt around the entire perimeter. All bedrooms have independent outside entrances. The house is primarily heated by woodstove with electric baseboard heaters throughout. There is a front porch screened in, a back covered porch and back deck. The deck has a wood fired sauna built independently off the end of it. Sauna can easily seat 6 or more persons and has an outside shower attached. The interior of the house is finished with recycled weathered wood acquired from sites all over the islands. The kitchen is constructed of spalted alder, which was milled from wood on the property, and crafted by one of the children of the owner. The countertops are hand carved western maple. The house has a 200 amp electrical service. The roof is re-sawn cedar shake, installed in 2009. An original structure on the property a roughly 1200 sq. ft. Barn has a full basement foundation of cinderblocks. Built in the 50’s. The barn has been fully converted to a living space, which includes a sleeping loft and one or two bedrooms downstairs. The walls have been taken down in one of the rooms to provide a common area and only one bedroom at present. Also includes a full bathroom and a laundry room. The kitchen/dinning/living room area is open space and has a fantastic view of Mount Arrowsmith. Electrical service is 200 amps. Original cabin was one of the Eagle Crest chicken coups, now has around 800 sq. ft. has one bedroom and a kitchen/dinning/living area. Heated by woodstove but includes electric baseboard heat. Full bath and laundry room. An outside entrance accesses laundry room. In our operation it is made available to the other two smaller units as well. Fantastic view of the Mountain. This cabin is built from one of the chicken coups. Now roughly 650 square feet. It has a sleeping loft and a built in couch that also doubles as a single bed. There is a bathroom with shower. 60 amp service but no electric heat installed, heated by wood stove only. This unit has an excellent view of the mountain. The the “Caravan” is a “tiny home” built on the chassis of a early 50’s Chevy 3 ton flat bed. The truck used to be driven to Mexico every winter and back for spring but was parked in the early 90’s where it has remained since. The cabin on the back was completely rebuilt using recycled and property milled woods. Has electricity and hot and cold running water. Heated by electric baseboard heat. It has a kitchen area, shower and closet space, fold down table, couch/bed and over cab bunk. Sleeps 4 or 5 best for 1 or 2. The toilet is an outhouse at present with plans to upgrade to a composting toilet. All of the units (except the Caravan) have independent septic tanks and fields. All were inspected last year and pumped out. All are functioning well. The barn has the oldest, installed in the mid 80’s, and has never had issue. The Mountain cabin is the next oldest, late 90’s, and is a 2-chamber system with an R.V. dump. The field is situated in sandy gravel and has never had issue. The main house is a single tank system and was installed in the mid 2000’s; the River cabin was installed late 2000’s and is a 2 -chamber system. No issues with any of the systems which have been regularly serviced. There are a number of other out buildings including wood sheds, a dirt floor garage, an old chicken coup converted to a shop, tool and garden sheds and an old goat shed. There is a garden area considered community for all the tenants to use and private area for the main house. This garden area has been used in the past for cash crop gardening. There are various ornamental plants, trees and flowers all around the property. Also there is an old, out of commission, green house in a state of disrepair. There is an orchard with 4 apple trees, 2 pear trees, a couple of plum trees and a few healthy blueberry bushes. As well as raspberry canes and strawberry patches, asparagus bed and managed wild blackberries. The entire property now operates off of one well, which has a dual pump system with a 500 gallon cistern. The well is on an underground stream and replenishes swiftly when pumped dry. The trail to the river is in need of repair. The neighboring property has a road, which runs partially down the property line and has been jointly used as an access trail to the river. This is the current access route to the river. This property for sale has been tagged by the seller as close to Bowser, Comox, Coombs, Courtenay, Cumberland, Denman Island, Fanny Bay, French Creek, British Columbia. Thank you for viewing this For Sale by Owner property in Qualicum Beach, British Columbia.